By the time I was 6 yeas old, I was already hooked on airplanes, specifically airliners. Oh, those were wonderful days. Back in the 1960s, you could walk through the airport and collect a treasure trove of good stuff from the airline ticket counters. Timetables, postcards, stickers…you name it. Even better, you could write to the airlines and they would send you ALL SORTS of collectibles. My favorites were the pictures of airplanes that they would send. Postcards, 8 x 10 black & white glossy photos (sometimes, even color photos! ), and even posters. Even the airplane manufacturers were generous in their giveaways. I was happier than a pig in mud. What a terrific time to be an aviation enthusiast! Every year, I would send out a new batch of letters to the airlines. Sometimes I would get new pictures, but more often, I would get the same pictures I did the year before. It was only a matter of time before the inevitable happened. In 1969, I bought my first camera, a Praktica single-lens reflex capable of handling interchangeable lenses. I bought a 135mm telephoto lens and set out for the new closest airports from my home at the time on Long Island. My weekends became consumed by heading out to La Guardia and Kennedy Airports, camera in hand. I’d found my passion! In retrospect, what I wouldn’t give to go back in time 50 years with today’s photo equipment…and a little better skill in airplane photography! The following 12 years brought some fascinating travel opportunities, each better than the previous one. Those years will be covered in future articles on this blog. In 1981, I got my big break. I became the regional airline correspondent for Professional Pilot magazine. I also grew a set of big brass ones, and walked into the offices of Aviation Week with some air-to-air photos. I walked out with a cover photo. That was sort of like hitting a grand slam at my first major league at-bat. My early accomplishments gave me the credibility I needed to approach regional airlines and offer to take air-to-air photos to use in the “Commuter Corner”. I’d hit avgeek nirvana! Over the next several years, I was blessed to have the opportunity to take a pretty good collection of air-to-air photos of some awfully neat airliners. Here are a few of them. Henson Airlines was the first commuter airline in the United States to forge a code-sharing agreement with a larger airline. In 1967, president Richard Henson inked a deal to provide replacement service for Allegheny Airlines between Hagerstown MD and Washington National Airport. In 1983, Henson flew the coop. 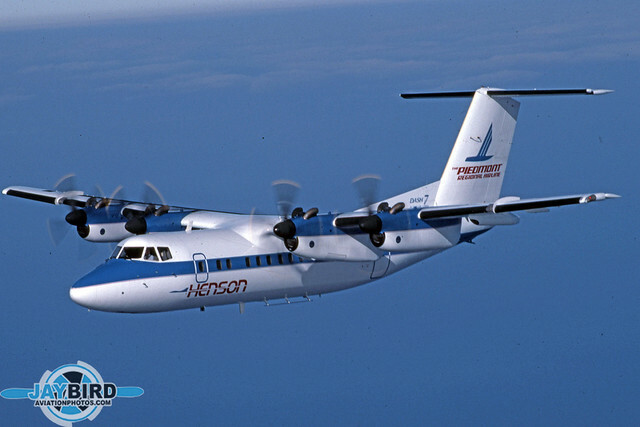 Piedmont Airlines was looking to establish a hub at Baltimore-Washington International Airport, and purchased Henson Airlines to provide regional feed to the up-and-coming airline. 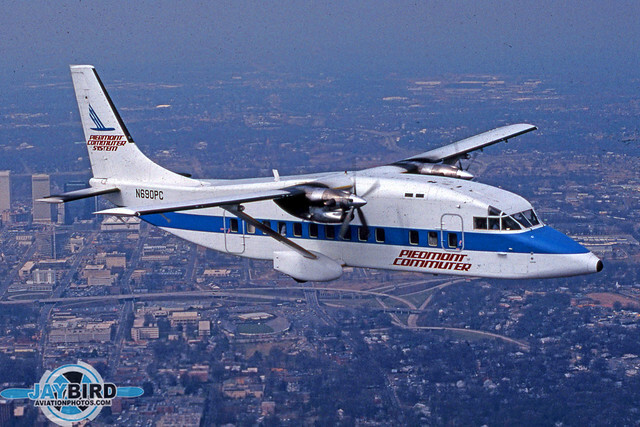 By January 1984, N900HA, Henson’s first DHC-7, was painted in Piedmont Regional colors. I was invited to Salisbury for a very special photo shoot. Mr. Henson was in the left seat of the Dash. Of all the aviation personalities I have met in my career as an aviation photojournalist, Richard Henson was probably my all-time favorite. To me, he epitomized the pioneer airline CEO of an era that, sadly, is long gone. When I was in Salisbury MD photographing the Henson fleet in their new Piedmont Regional Airlines colors, he took a few minutes to take up his Beech King Air 90 to pose for some photos. He was delighted with the photos I gave him, but he also confided that the King Air’s days were numbered. 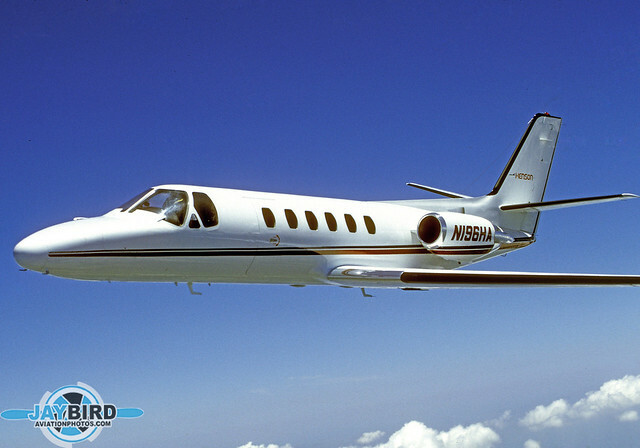 It took nearly four years, but in 1987, he traded in his King Air for a Cessna Citation II (SP). I was delighted to return to Salisbury to take some photos of Mr. Henson flying his new chariot. 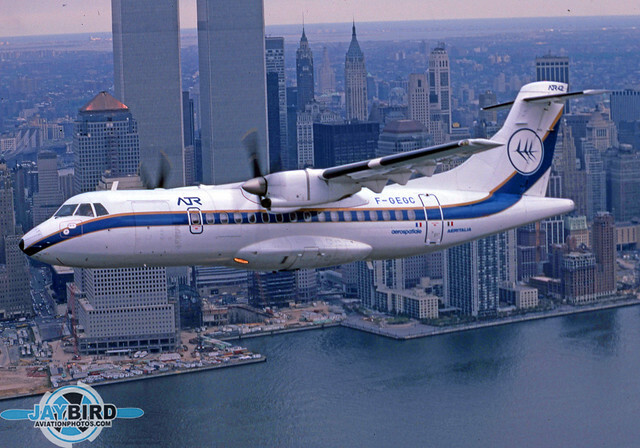 In October 1985, Aerospatiale brought its first ATR-42 demonstrator to the United States to show it off to Ransome Airlines, which was looking for a replacement aircraft for its Dash 7. Ransome eventually bought a modest fleet of ATRs but by that time, Ransome was operating as a Pan Am Express and the ATR-42 appeared in the iconic Pan Am color scheme. I covered this event for Commuter Air magazine, and this was my first cover photo with that publication. By 1980, it was clear that the commuter airline industry in the United States had reached puberty. 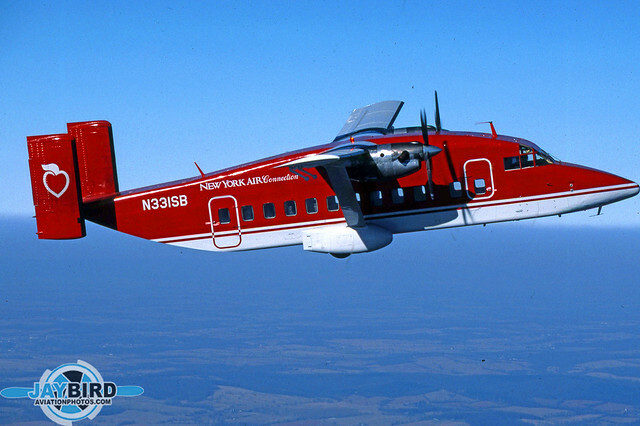 Until then, the mainstays of the industry had been the Beech 99 and De Havilland Canada Twin Otter, both unpressurized. 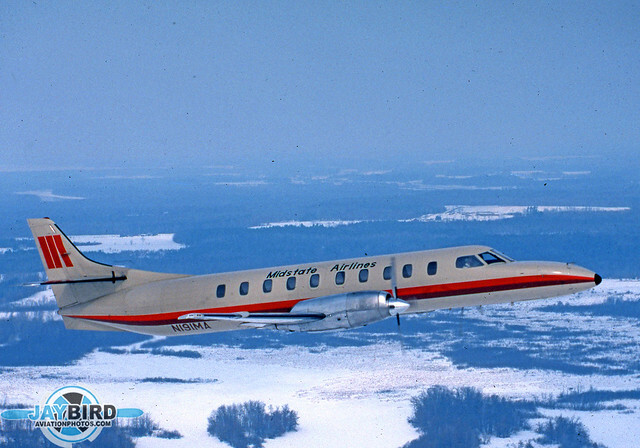 Swearingen was having some success with its pressurized Metro, essentially a stretched version of its Merlin corporate aircraft. However, early versions of the Metro were often severely weight-restricted. In 1980, British Aerospace entered the 19-seat fray with its Jetstream 3100, an upgraded version of the original Handley Page HP.137 Jetstream. 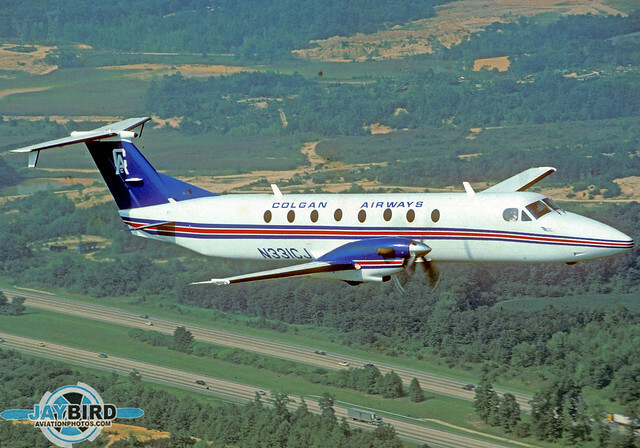 The “new” commuter airliner boasted significant performance improvements over the original Jetstream, primarily due to replacing the original Turbomeca Astazou engines with the lighter and more powerful Garrett TPE-331 turboprops. 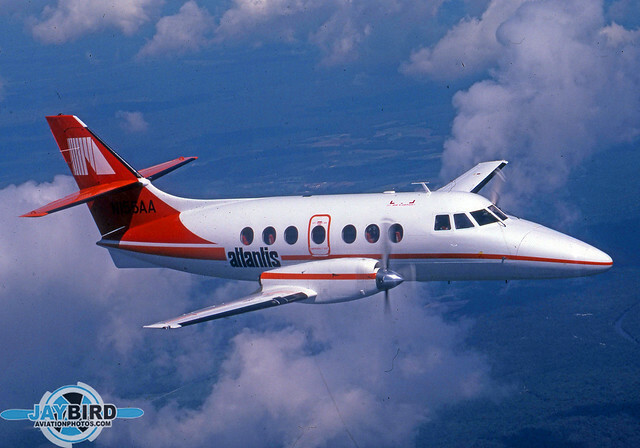 The second production Jetstream 3100, N155AA, was leased to Atlantis Airlines, based in Florence SC. 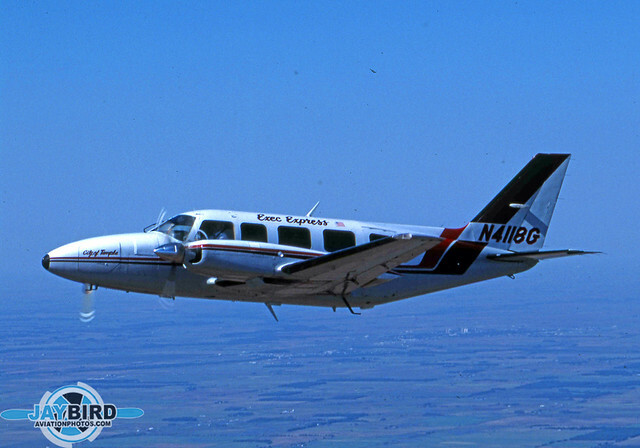 The other new entrant in the pressurized 19-seat market was the Beech 1900C, which was developed as a stretched King Air. 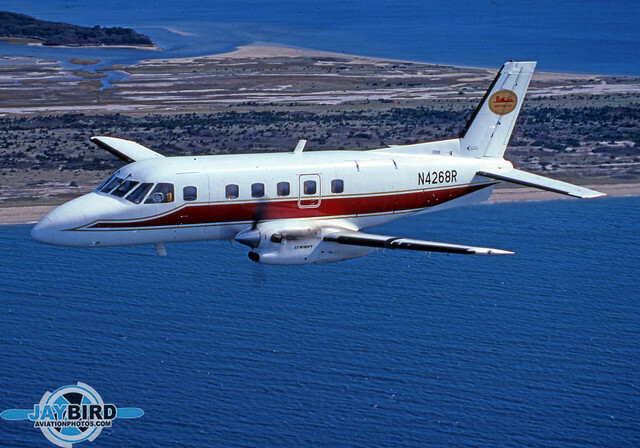 Although it was introduced to the market a full two years behind the Jetstream 31, the Beech 1900 outsold the British rival, nearly 2 to 1, Brockway Air, based in Burlington VT, first acquired its Beech 1900s through its absorption of rival Clinton Aero. In 1986, Brockway joined the Piedmont Commuter system. Brockway Air also acquired a trio of late-model Fokker F-27s when it bought Air North. Shortly after the fleet was painted in Piedmont Commuter colors, I decided that the airline was ripe for coverage by Commuter Air magazine. While I was at company headquarters in Burlington VT, we arranged for an air to air photo shoot with N421SA. This has turned out to be one of my very favorite photos. The thin layer of clouds above us diffused the light just enough that the photo looks more like a painting. N421SA, by the way, was originally sold to West Coast carrier Swift Air, and later sold to Air North. 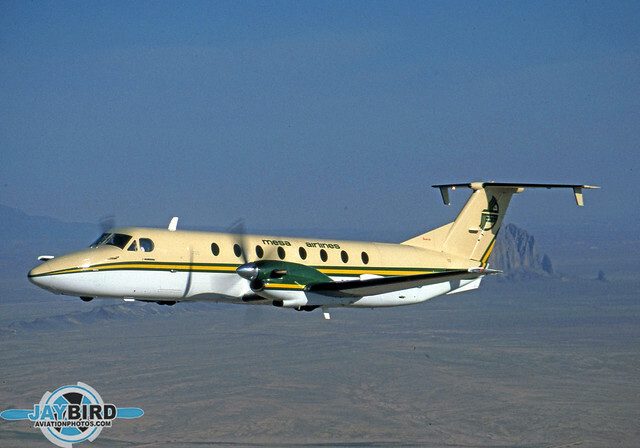 Back in the late 80s and very early 90s, Mesa Airlines operated a growing fleet of Beech 1900s. N91YV is shown in the carrier’s original color scheme with Shiprock in the background. 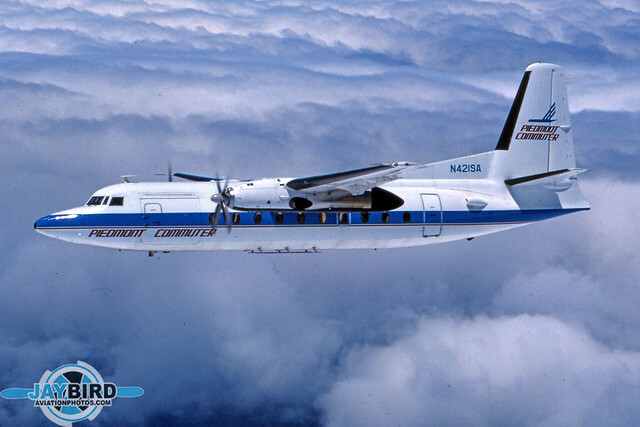 Back in those days, Mesa was just one more small airline trying to keep its head above water! Colgan Airlines grew into a small regional airline from its beginnings as a Fixed Base Operator (FBO) at Manassas VA. Owner Charles Colgan was also a Virginia state senator. 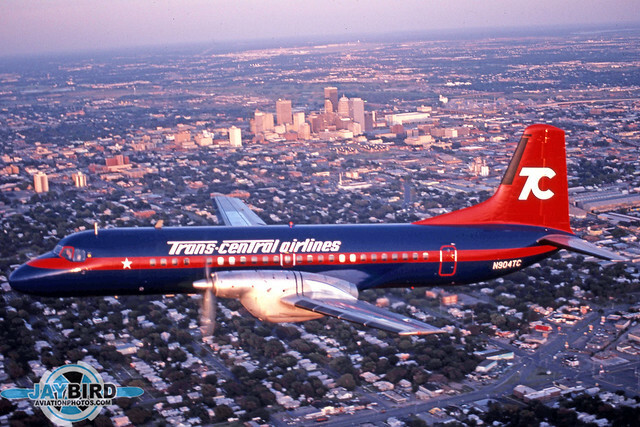 The airline began operations as an independent carrier. 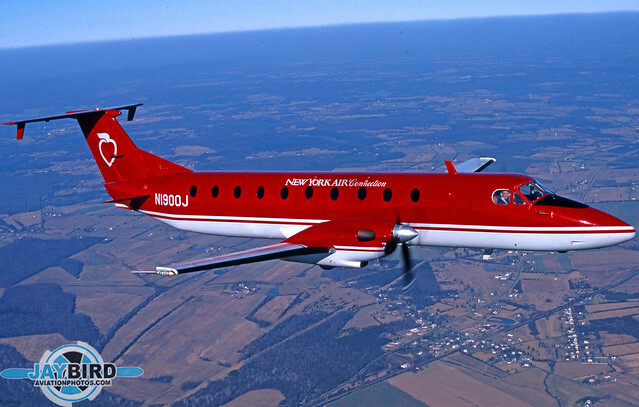 N1900J, was airframe UA-3, the last pre-production Beech 1900. 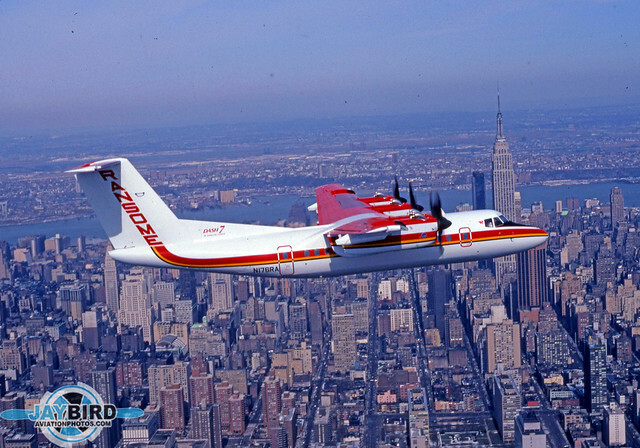 It was leased to Colgan Airlines shortly before the carrier struck an agreement with New York Air.Shortly after N1900J was leased to Colgan, the carrier became a New York Air Connection operator, and its fleet was painted in the distinctive red of colors of the larger airline. I photographed N1900J high above the rolling Northern Virginia countryside. As a New York Air Express carrier, Colgan flew what was probably the most easily identifiable Shorts 330 in the country. Over the years, I have photographed N331SB in several different color schemes, but this one was certainly the most eye-catching. 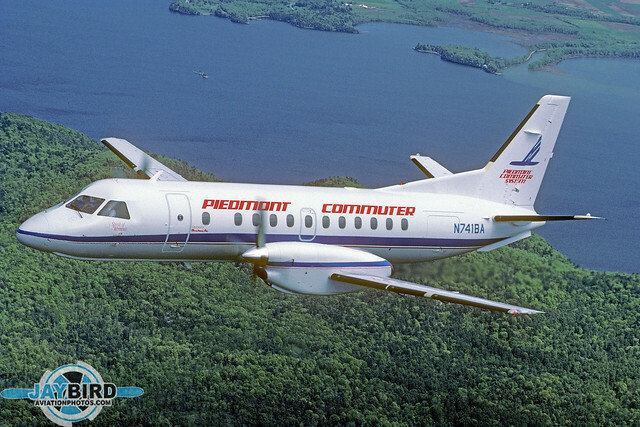 There was something about the Piedmont color scheme that helped ANY plane look good…even the Shorts 330! 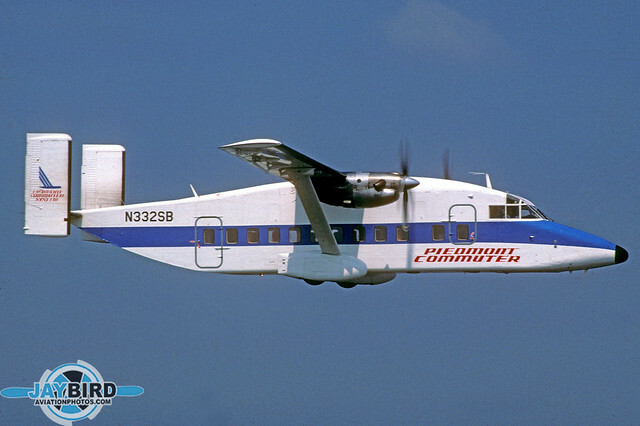 N332SB was originally delivered to Sunbird Airlines, which later changed its name to CCAir when it became a Piedmont Commuter carrier. 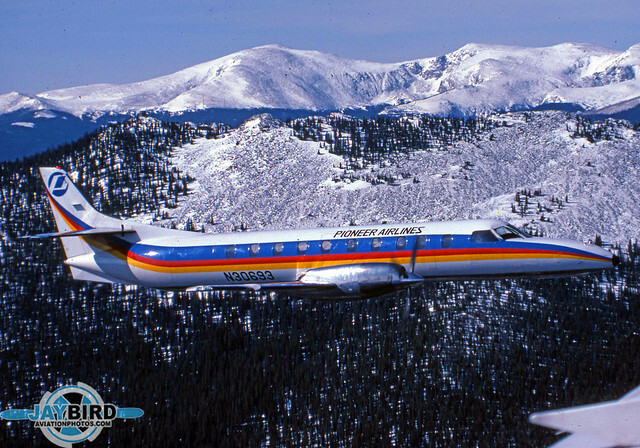 While Henson Airlines was wholly-owned by Piedmont, CCAir remained independently owned. 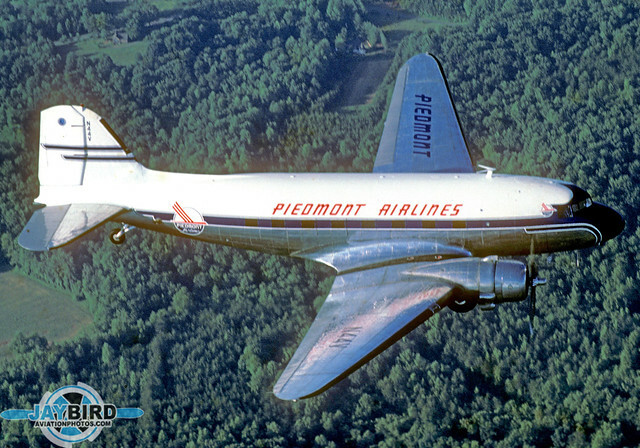 Back when Piedmont Airlines was still Piedmont Airlines, the company owned and flew a vintage DC-3, N44V. During the height of airshow season, the Grand Old Lady appeared almost weekly at shows up and down the East Coast. Today, of course, N44V resides, non-flying, in the Carolinas Aviation Museum at Charlotte-Douglas International Airport. I was able to manage this air-to-air shoot in the summer of 1987. Air Vermont, based in Burlington VT, was one of the early operators of the Beech C-99, which boasted a higher gross weight than the earlier “B” models.The C-99 was easily distinguishable by the deep cargo bin suspended from the belly. 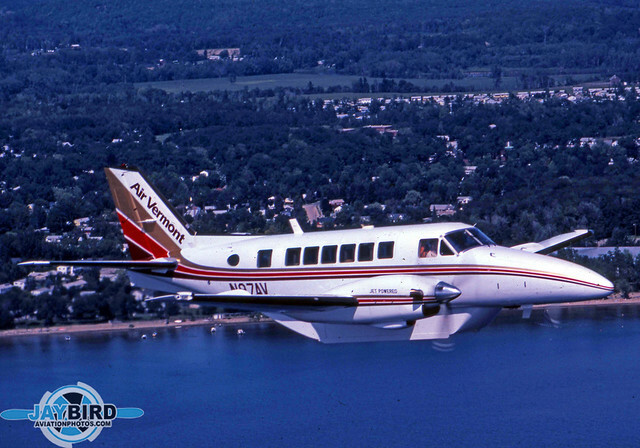 I photographed N97AV hugging the shoreline of Lake Champlain in August, 1983. 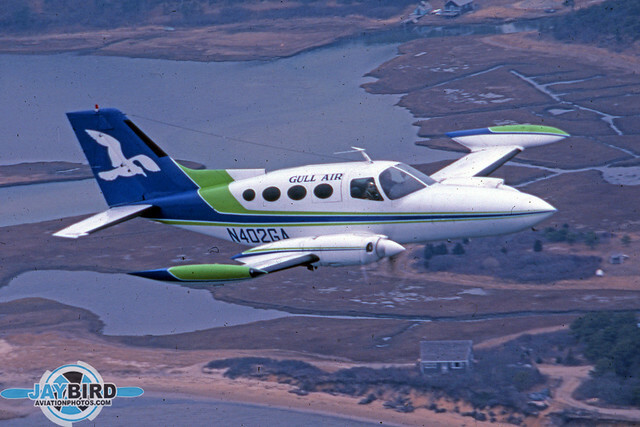 Gull Air operated a fleet of handsome Cessna 402s. Typically, the bulk of its fleet spent the summers in New England and winters in Florida. I captured N402GA over Hyannis, MA. 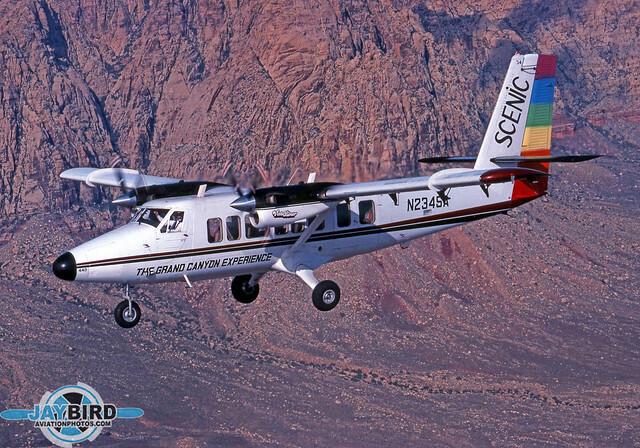 Scenic Airlines led the way in converting the venerable Twin Otter into an aircraft more suitable for sightseeing. 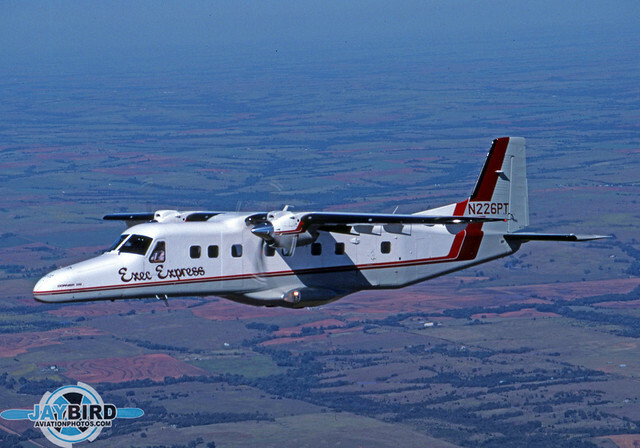 The DHC-6 was refitted with larger windows and a four-bladed prop which reduces noise inside and outside the cabin. These Vistaliner conversions are in use around the world today. That’s right, it’s a New York Air Bandeirante. Not THE New York Air, but a division of Starflight Airlines with the same name. I captured N4268R flying along the south shore of Long Island. 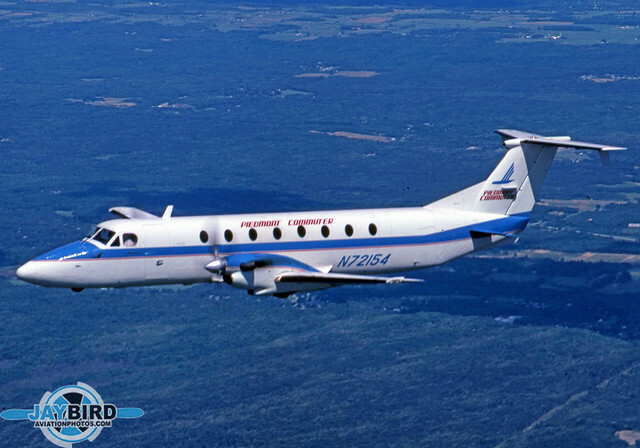 As Brockway Air continued to operate as a Piedmont Commuter carrier, the company determined that its Fokker F-27s were too expensive to operate, and chose to replace them with the smaller but considerably more efficient SAAB 340, including N741BA. 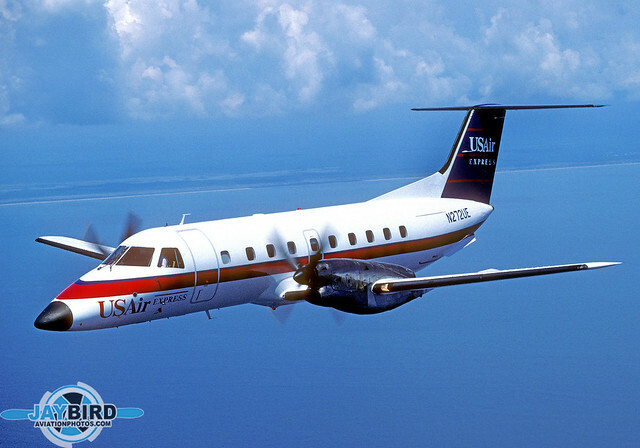 After the merger with Piedmont, USAir began dismantling the highly-successful Florida Shuttle and replaced the jets with Henson Airlines Dash 8s on heavier routes, and Embraer Brasilias on thinner routes. Florida Gulf Airlines was formed under the Mesa Airlines certificate to operate as a USAir Express carrier focused on Florida and the Southeast. As the commuter airline industry began to mature, regulations were changed to permit operation of aircraft weighing more than the previous limit of 12,500 lbs. As aircraft manufacturers scrambled to design and build larger regional aircraft, Gulfstream Aerospace saw the potential to extend the useful life of its venerable robust Gulfstream 1. developing the Gulfsteam I-C. By extending the fuselage by 10’8″, seating capacity was increased to 37 passengers. Sadly, baggage capacity was not similarly increased, and Gulfstream abandoned the program after converting five aircraft. Resplendent over the Rockies. 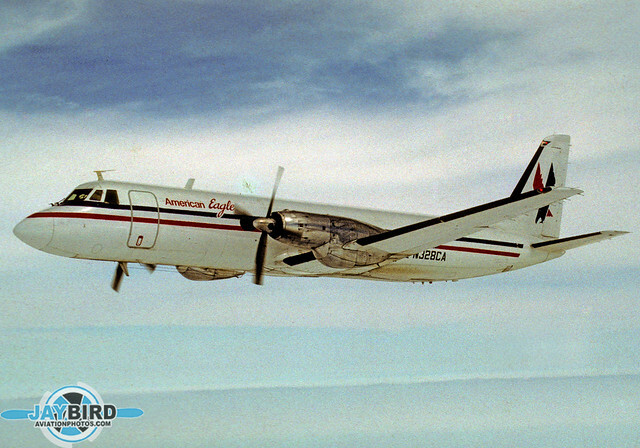 Pioneer Airlines was an early operator of the Metro III, and this represented one of my more challenging photo shoots. I was in a Beech 99 with the emergency exit door removed, and we were flying at an altitude of some 12,000 feet. I didn’t realize I was hyperventilating until my backup slapped an oxygen mask over my face! The effort was worth it, however. 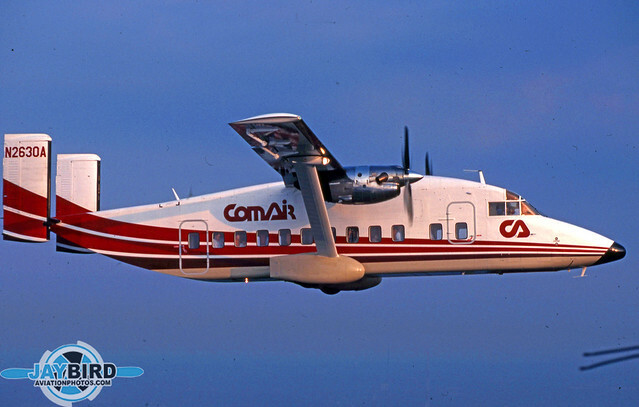 Cincinnati-based Comair was an early (and short-lived) operator of the Shorts 330. The airline holds a special place in my heart, as it was the subject of my first full-length aticle published in Professional Pilot magazine. N690PC was the first Shorts 360 delivered to CCAir. The 360 was a somewhat larger, somewhat less ugly development of the 330. It is incredible to see how drastically the Charlotte skyline has changed in some 30 years.